Heat all together until the sugar is dissolved and then simmer for 15 minutes – leave to cool – don’t pour hot syrup over hot pastry as it will go soggy – no one likes soggy pastry! 225gr/2 cups of pistachio nuts, walnuts and almonds (I use mostly pistachio’s as they are my favourite). 375gr/1 pack of ready-made filo pastry– take out of the fridge and bring to room temperature. Have a damp cloth ready to cover and keep the pastry damp while you are using it. If it dries out it will crack. Grease a 28cm x 18cm shallow baking tin with the melted butter (using a pastry brush if you have one) and then layer 4 sheets of pastry in the tin, brushing each sheet with butter. You don’t have to be neat, just fold over any extra pastry. Then put half of the nut mixture followed by another 4 sheets of pastry, then the rest of the nuts and finish with a pastry layer. Brush the top with butter and cut into diamonds with a sharp knife – ensure the blade goes right to the bottom. Bake at 180c/gas 4 on the middle shelf of the oven on a hot baking sheet for 30–35 minutes, or until golden brown and crisp, reducing the temperature to 170C/gas 3 if the baklava looks as though it is browning too quickly. Remove the baklava from the oven and spoon half the cooled syrup over the top. Leave for 5 minutes before pouring over the remaining syrup. 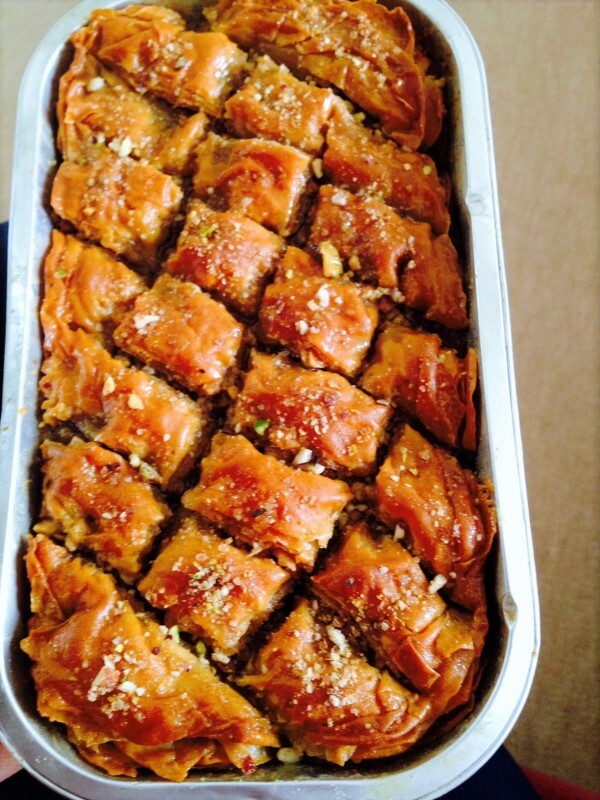 Allow the baklava to cool before removing the individual pieces from the dish.